Americans seem to hate their jobs in record numbers today. Gallup surveyed 150,000 workers. Only thirty percent are into their jobs. Fifty-two percent openly admit they are not. And eighteen percent say they are actively disengaged, with a permanent case of the Mondays. I was surprised by these numbers, though I guess they cover a wide audience. It is difficult to find work and many professionals have to settle on a job to pay back college loans and/or support a family. One of the driving forces for adopting a skills-based approach is to develop an effective career plan. I believe your career is an opportunity to make a once in a lifetime contribution. I agree with what Seth Godin says: you should become a “linchpin” (not merely a “drone”) and “an artist” – someone who creates fresh, insightful work. I also think you should find happiness with your career. I passionately back these two assertions. I think for many professionals the source of the problem is not conducting enough career planning during the formative stages of their life – high school, college, and young adulthood. Many young professionals do not have a firm grasp on their strengths, inner motivations, and personality traits. Moreover, they do not formulate an action plan to reach their career aspirations. In the planning stage of a skills-based approach, there are four strategies to help develop an effective career plan. Cleary professionals cannot always find a job that makes them happy. Sometimes professionals are forced to take a job solely as a source of income. And some jobs have some unpleasant and pleasant responsibilities mixed together. A career plan (from a skills-based approach) is meant to be a short-term guide and a long-term proposal, so the concept is to move towards career pursuits that will make you happy in the long run. You are developing a skill set, which you commit to develop throughout your career. If you are working at a job just to pay the bills, then figure out ways to build skills while you are working (taking on projects) and/or after you are working (an online course, volunteering, etc.). Another advantage in adopting a skills-based approach is planning your career based on a skill set rather than careers and degrees. 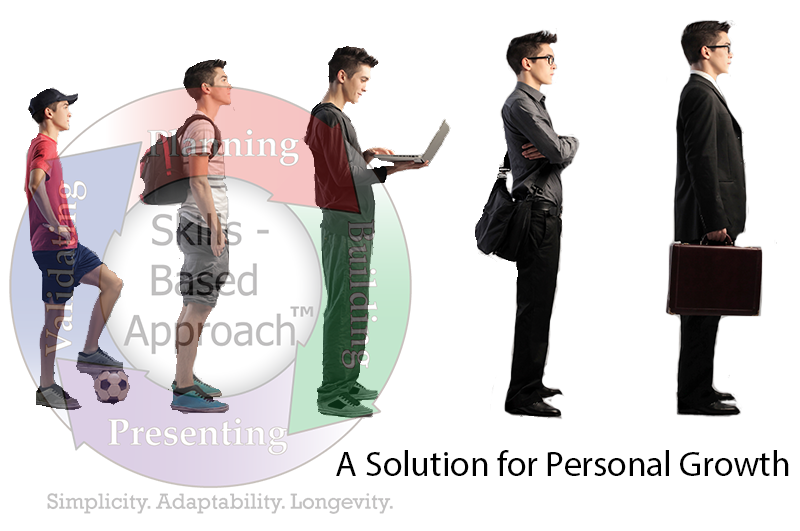 Professionals can employ various actions to build skills. In combining these actions, they create the most cost-effective career plan. A skills-based approach suggests building transferable skills that can be utilized across disciplines and subjects – so professionals become more marketable in a constantly changing job market. Finally, I think having a plan to reach career aspirations demonstrates vision – a motivator when someone is working what seems to be a dead-end job. Skills-Based Approach is a methodology centered on the development of a skill set over a career; it is a progression in four stages: planning, building, presenting, and validating. Each stage has proposed ways to achieve its objectives. The beauty of a skills-based approach is its simplicity and flexibility. I recently read an article in the Wall Street Journal about how underemployment is going to remain persistent even as the economy recovers. [i] Underemployment refers to skilled workers doing jobs that do not require their level of education. For example, someone who recently graduated with a degree in marketing who is working in a coffee shop making a little more than minimum wage. There are a few ways practicing a skills-based approach alleviates the problem of underemployment. First, you define your professional experience and knowledge as a skill set rather than as a degree or career so you are more flexible to adapt to the current job market. Your skill set is comprised of transferable and technical skills. Transferable skills – such as writing, computational thinking, and problem solving – can be utilized across disciplines and subjects. You should be able to construct a list of many different career paths based on your skill set. Perhaps you have to spend some time learning a technical skill before applying to a career you had not targeted earlier. Let me provide an example. Jim graduated with a degree in marketing and is seeking a marketing position setting up website promotions. There were few openings for this type of position; however, through his job searching he realized interpreting web analytics is a hot opportunity. He has no prior experience with web analytics but could learn it fairly quickly by taking an online course. And many of the skills he learned while getting his marketing degree are relevant for this opportunity. So by adding a technical skill of web analytics to his skill set, Jim increases his chances of becoming employed. Second, you find ways to make any job an opportunity to develop your skills; your job becomes a stepping stone to something in the future. Many young professionals have to settle for a job because they need to earn an income, so they find a job that is not necessarily aligned with their capabilities or career objectives. Nevertheless, no matter what the job, they should find ways to build skills. For instance, using the example above, a coffee shop employee volunteers to build a website that promotes the coffee shop for free (there are many free website builders to choose from); so a seemingly dead-end job becomes an opportunity to build web development and marketing promotion skills. Third, you build the skills necessary to reach a longer term career on your own time. So as you are working at the coffee shop to earn an income, you spend the afterhours building an expertise with your skills. You may choose to volunteer, take an online or on-site course, or read a book to advance you expertise with skills. Whatever way you choose, you become more marketable for future opportunities by fine-tuning your skills. Building skills is more efficient and accessible and less expensive than adding degrees. [i] Ben Casselman, “College Grads May Be Stuck in Low-Skill Jobs,” Wall Street Journal, March 26, 2013.